When she was six or seven years old, Caroline Lathan-Stiefeloften visited Atlanta’s High Museum of Art with her mother, who was a docent. Mesmerized by Alexander Calder’s miniature wire Circus—complete with ringmaster, horses, clowns, trapeze artist, and lion tamer—she went home and tried to make her own three-ring figures. Lathan-Stiefel’s work could have that same effect on those who see her “Project Atrium” installation, on display through Oct. 26 at the Museum of Contemporary Art Jacksonville, a cultural resource of the University of North Florida. 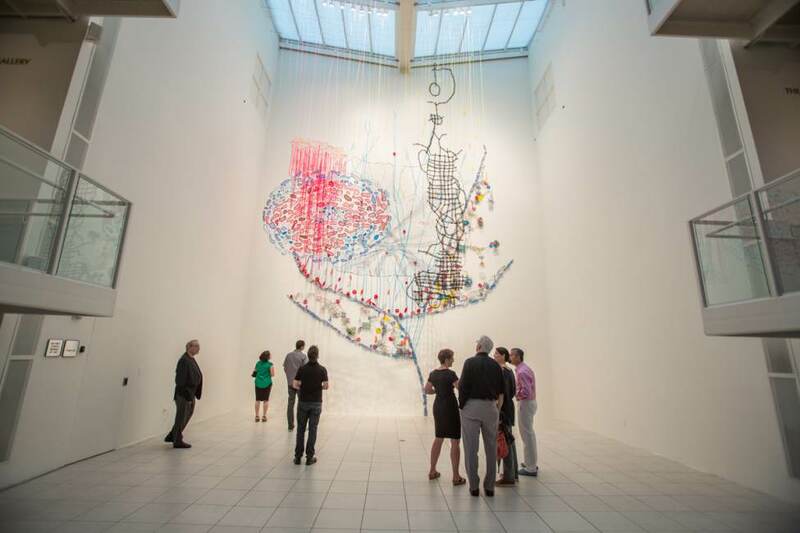 This site-specific sculptural work made of an array of mostly textile materials—pipe cleaners, wire, thread, yarn, string, fabric, plastic, and fishing weights—suspends from the skylight girders to forty feet below. A series of monumental, intricately woven curtains include three-dimensional elements, translucent fabrics, and open areas that allow viewers to peer through multiple layers. Small, abstracted textural objects referring to the detritus of daily life (cups, plants, keys, cellphones, etc.) and textile “words” are woven into these layered panels. The floor-to-ceiling piece takes full advantage of the Atrium’s height, allowing visitors to experience the piece from each floor of the Museum. Lathan-Stiefel described the piece as a layered monumental textural painting where color and light play an essential role. The interplay among shades of red, blue, and black takes on new dimensions when lit by gallery lights that emphasize certain details and create shadows that become a part of the overall work. Natural light from above creates changes in depth and color throughout the day. Since 2000, Lathan-Stiefel’s installation work has focused on rhizomatic structures inspired by marine and plant biology, as well as architectural and urban models. But the monumental space at MOCA Jacksonville inspired her to do something different for Project Atrium. The series features emerging and mid-career artists who create site-specific or site-sensitive works for the prominent Haskell Atrium Gallery. Each installation is an active collaboration between the artist and the gallery’s towering proportions—a challenge that often propels the work in exciting directions. After her father suffered encephalitis in 2012, which caused temporary damage to his speech, she began to think about how the circuitry of the brain can be scarred and damaged and then “regrow” itself, like a plant. The artwork explores both the science and the experience of the brain—a kind of mapping of the neurological landscape, with all its fissures, colors, sparks, germinations, stoppages, and flowing circuits. Some of the embroidered words represent the first words her father spoke after his brain injury, words that became placeholders for many different things. The abstract objects could be seen as items from daily life that occupied his thoughts. The shock of her father’s illness and resulting brain injury propelled Lathan-Stiefel to incorporate those anxieties into her work. Her father, now 76, was still working as a doctor but had to stop after the illness. She entitled the installation “Wider Than the Sky,” based on Emily Dickinson’s poem, which addresses the brain’s capability to contain immeasurable vastness and creativity. “For me, it’s playing with the idea of how something as small as a brain can contain such a vast array of thoughts and concepts, such an immensity,” she said. She also found inspiration in drawings by Santiago Ramón y Cajal, a 19th century Spanish neuroscientist who made hundreds of illustrations of the delicate arborizations of brain cells that are still used for educational purposes. As a way of paying homage to the craft and detail he poured into his drawings—and the intricacy of the brain itself—Lathan-Stiefel decided to employ more time-intensive sewing techniques on “Wider Than the Sky” than she has in previous works, which were often held together by pins. A few assistants worked four or five hours a week helping her pin material to the structures, and a neighbor helped her sew. Each section took four to ten weeks to construct. She began her art career as a painter, and that translates to the color palettes she chooses for her textile installations. For “Wider Than the Sky,” her use of blue and red tendrils weaving together conjures images of arteries and veins. She often doesn’t know exactly how all the pieces will react with each other until she sees the final installation. She works in her garage studio, which is only fourteen feet high, so there is some improvisation on site. She lives and works near Philadelphia, where she also teaches art classes twice a week at the school her two children attend. She said she enjoys the wide range of skills and materials she can use, some of which appear in her artwork. She approaches her art classes the same way she approaches her artwork—research, planning, creating, and lots of improvisation. She sets parameters but allows room for surprise.